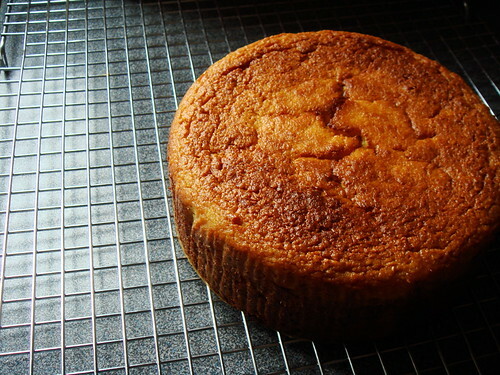 I had my doubts with the simple gluten free orange cake recipe. 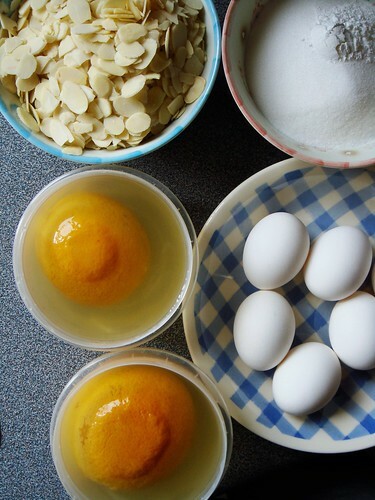 It uses only whole boiled oranges, almonds, sugar, eggs, and baking powder. Would it have the necessary structure or would it collapse under its own weight? It is suppose to be moist but “two large oranges” lack the precision to reassure me how wet the batter ought to be. I held my breath when the gorgeously golden cake emerged from the oven after almost two hours. Miraculously, it did not collapse. The dome top settled to a flat surface and the moist cake survived the unmoulding with no complaints. 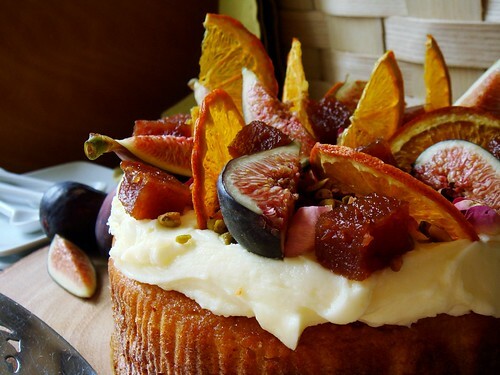 I made a fluffy cream cheese frosting and decorated to my heart’s content with the prettiest selection of dried orange slices, fresh black mission figs, homemade quince paste, dried rose petals, and toasted pistachios. The cake looked just as I remember from the crowded store in Sydney. As for taste, I like it very very much. 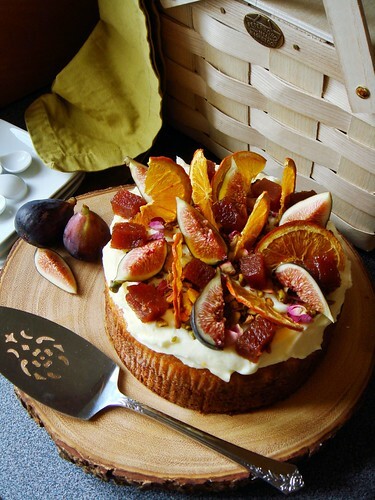 The cake is moist with big burst of orange flavour. Surprisingly, there is no hint of bitterness at all even with all the peel and pith in the batter. The crumb is dense but not heavy. 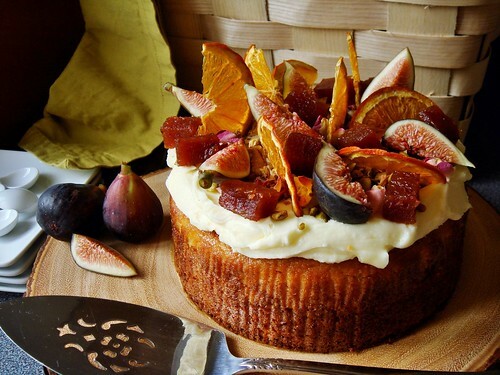 The ground almond retains some crunch which adds to the rustic appeal of this cake. 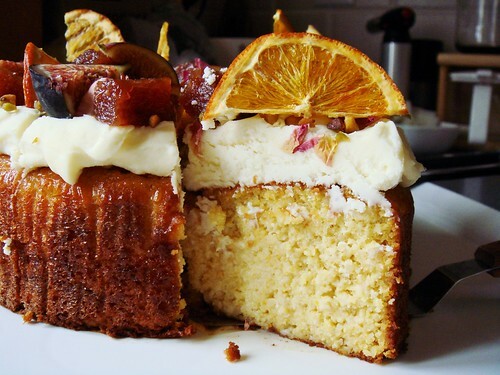 You can get an idea from the profile of the cake slice. 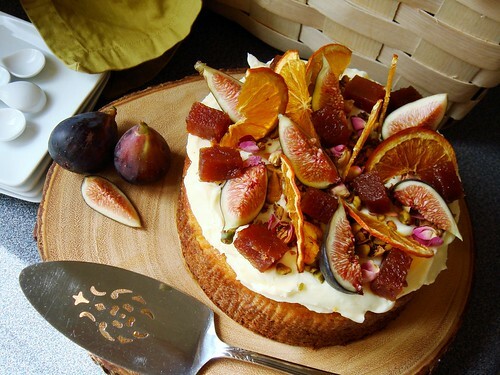 I am very pleased with my version of Persian Orange Torte with Cream Cheese Frosting. It will be my contribution on Cake Day this year. With only 30 minutes of active time, I will be free to enjoy the company of my friends and have a relaxing day! Unless I decide to tackle a second cake. The second cake is to be a sweet take on salad capresse and what I have in my mind is very involved. Perhaps I will be lazy and just stick with one cake. In any case, I now found my standby gluten free celebration cake. Many of my friends maintain a gluten free diet and I would like to bake something that they too can enjoy. The simplicity of this cake hides behind the most flamboyant decoration that make it fit for any celebration. I hope you too will give it a try. Place oranges in a medium saucepan filled with enough water to cover the fruit. Bring to boil and turn heat down to low. Simmer for 2 hours until soft and cool to room temperature. You can do this ahead of time and store the boiled oranges covered with cooking liquid in the fridge for up to 3 days. Preheat oven to 375F. Line a 7-inch round cake pan with 3-inch sides with parchment paper. This is not a typical size cake pan unfortunately. You can also use 8-inch spring form cake pan and wrap the exterior with foil to prevent leakage during baking. Place almond, sugar, baking powder, and salt in the bowl of an 11-cup food processor. Pulse until nuts turn floury. Empty to a large bowl and set aside. Lightly squeeze boiled oranges free of excess water. Tear into chunks with your hands and remove any pips. Place inside food processor and blend until smooth. 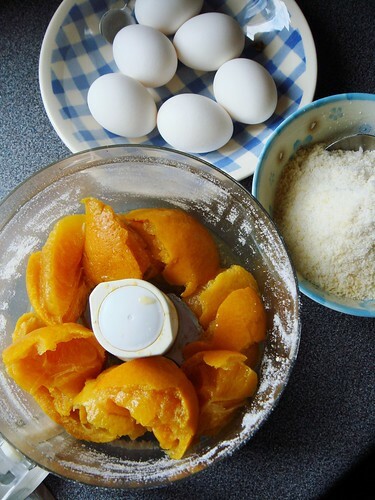 Add beaten eggs and almond meal mixture to food processor. Blend until homogenous. Pour batter into prepared cake pan. Set on top of a baking sheet and bake at least an hour until cake tester comes out with only a few moist crumbs. After the first 60 minutes, check every 5 minutes. Mine actually took close to 105 minutes before it was done. Let cool on cooling rack for about 10 minutes and unmould. Let cake come to room temperature. To make frosting, place 90g cream cheese and butter into the bowl of a stand mixer. Beat at medium speed until smooth using the paddle attachment. Beat in icing sugar and lemon juice until homogenous. Add remaining 90g cream cheese and beat until fluffy. Use immediately. Spread a thick layer of cream cheese frosting on top of cake. Smooth to even thickness with an offset spatula and make attractive swirls. Sprinkle evenly with rose petals and pistachios. 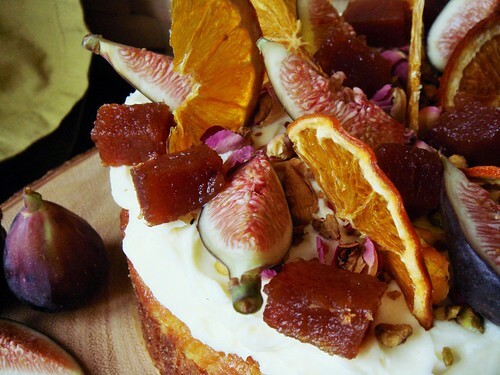 Decorate with dried orange slices, figs, and quince paste cubes. 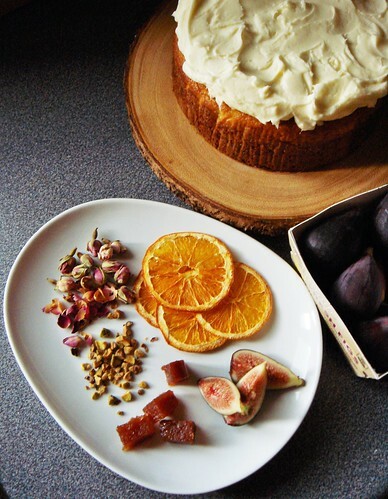 Cake can keep in fridge for up to two days.